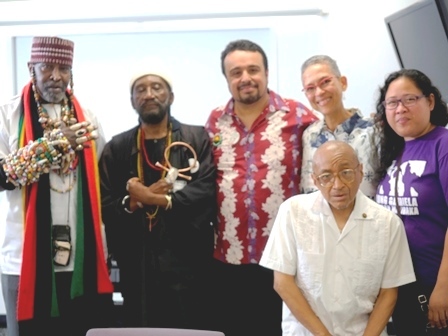 left to right, Brother Ambassador Aminifu, Baba Sr Amen Ra Schmm Khnuu, Ángel Martínez, Philomena Essed, Jonna Baldrés. Foreground: Carlos Raúl Dufflar. This dissertation is accompanied by 3 MP3 audio files and 13 MP4 video files. Dr. Ángel L. Martínez is a poet, professor, and performer. As Deputy Artistic Director of The Bread is Rising Poetry Collective, he has spent 25 years as a performing poet in festivals, readings, conferences, on stage, and on radio in the U.S., Canada, and the U.K. His poetry and articles have appeared in numerous anthologies, periodicals and journals including Drumvoices Revue, New Brunswick Free Public Library Poetry Anthology, Poems on the Road to Peace, and The Antioch Voice. 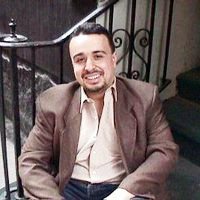 As a professor, Dr. Martínez is a student of the Puerto Rican Diaspora, he has 10 years of experience in higher education designing curriculum, facilitating workshops, and organizing field experiences where he weaves together creative writing, performance, and the social sciences for students who take their education con una taza de café. Martínez, Ángel Luis, "Young, Gifted, and Brown: Ricanstructing Through Autoethnopoetic Stories for Critical Diasporic Puerto Rican Pedagogy" (2015). Dissertations & Theses. 236.